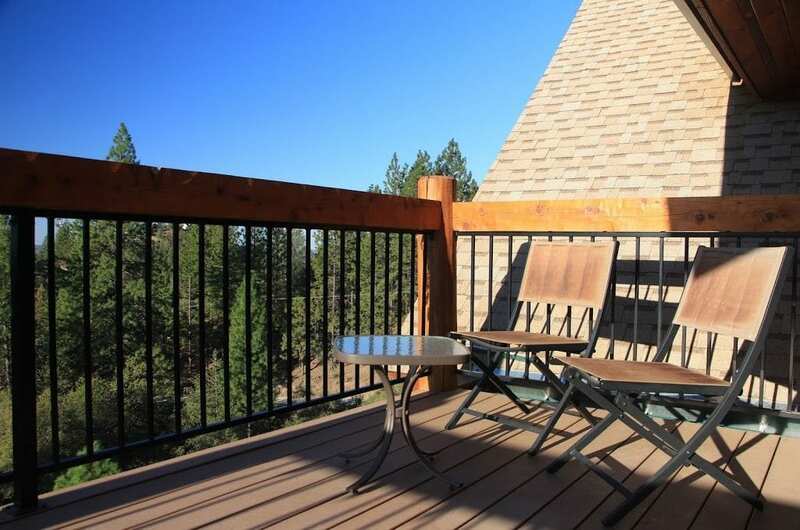 If watching Roger Federer win his eighth Wimbledon title over the weekend has you craving more Grand Slam aficionado fun, consider a stay at the Courtwood Inn just outside the historic Gold Rush town of Murphys. 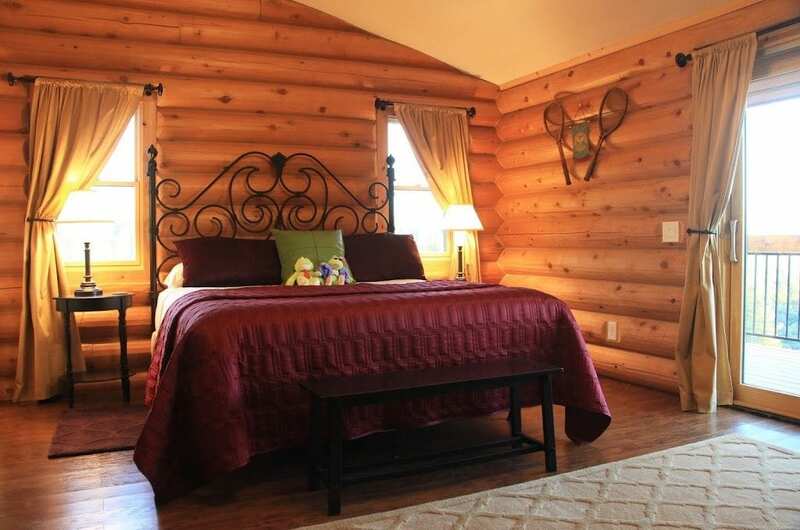 The 8,000-square-foot, newly-built, custom-designed cedar log lodge is owned and run by USPTA tennis pros Chris and Larry Parker. Each of the inn’s luxuriously appointed guest rooms pay homage to the world’s major professional tennis tournaments and its players. 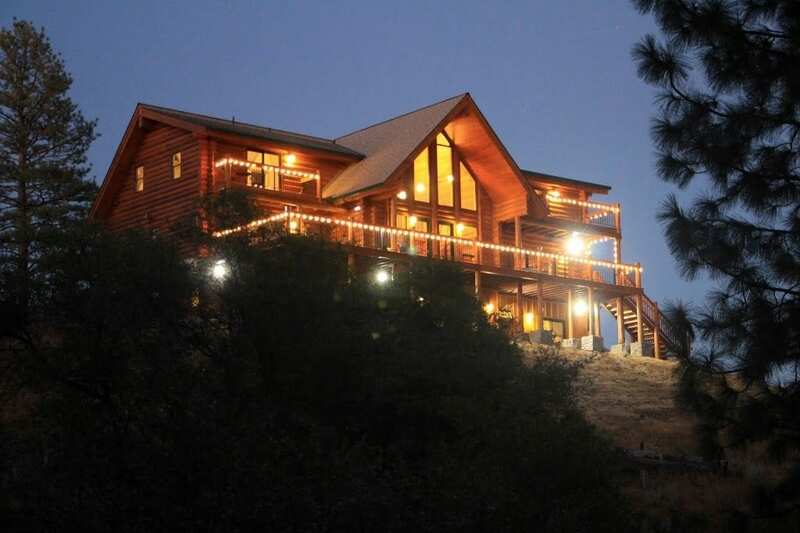 The grand lodge sits on a five-acre hilltop overlooking the Sierra Foothills and the San Joaquin Valley. 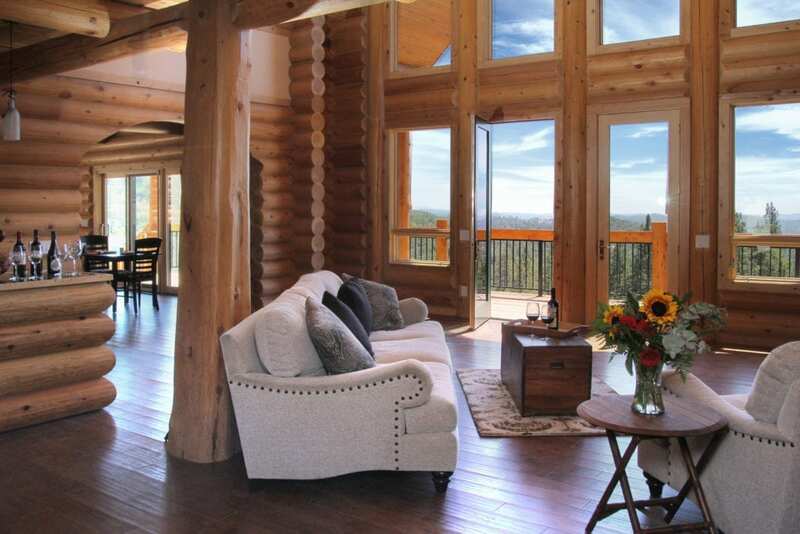 A soaring great room features plush seating, a gas fireplace, and towering windows with French doors that open to a spacious wooden deck with panoramic views. The great room’s beverage bar is open throughout the day for guest use and offers a Keurig machine for self-serve hot coffee, tea, and hot chocolate and a mini refrigerator stocked with soft drinks and juices. A changing assortment of cookies and other homemade treats are also available. During happy hour each evening, Chris pours local wines and serve artisanal cheeses, crackers, and fruit. 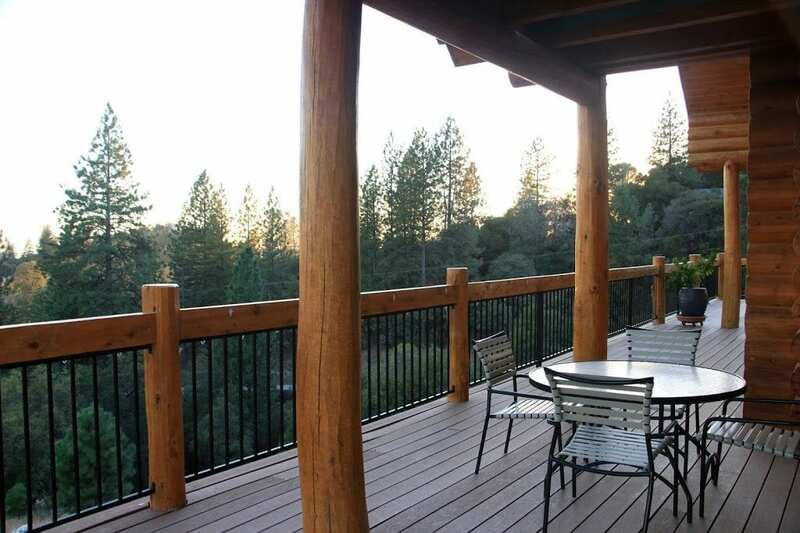 The outdoor deck provides a perfect spot for enjoying a glass of wine while watching the sunset. 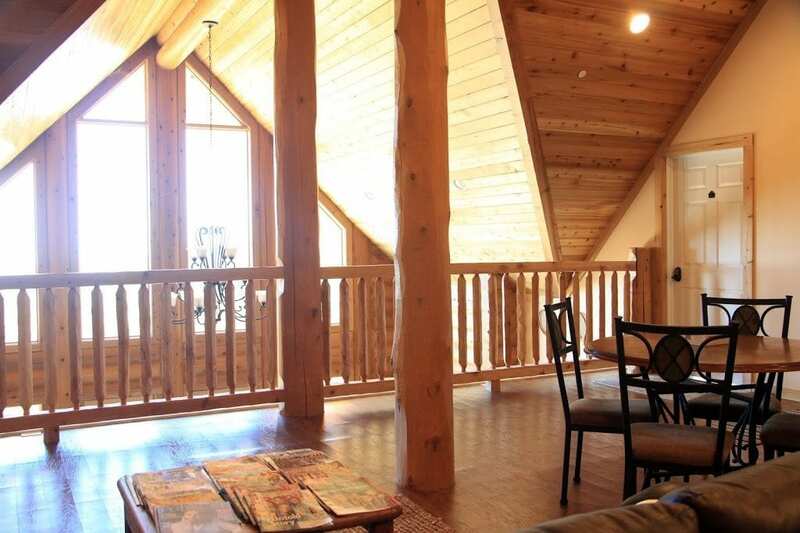 Upstairs, in the loft above the great room, guests will find a wide assortment of books and games. 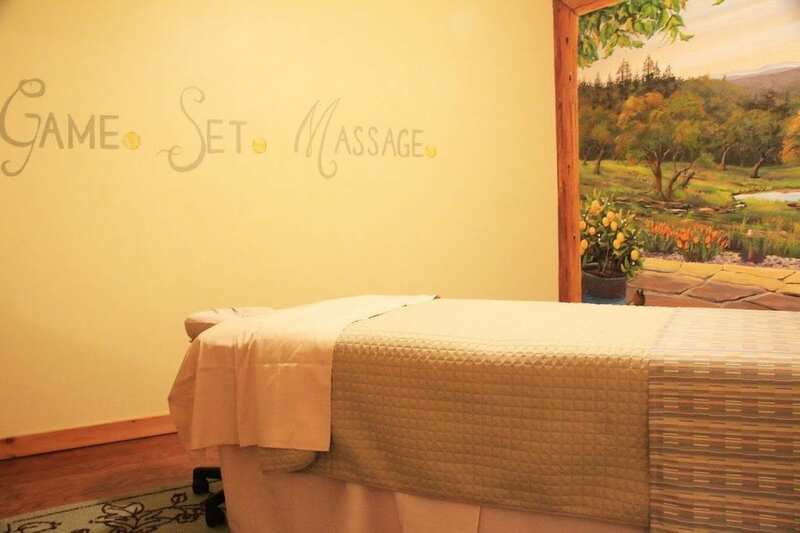 Downstairs, below the great room, you can challenge your partner to a game of table tennis or indulge in a relaxing massage in the inn’s private spa room (massage packages are available). Two championship tennis courts are currently under construction behind the inn. Larry hopes to begin offering private tennis lessons in September. Plans are also in the works to build an outdoor hot tub and fire pit for guests to enjoy under the star-filled skies. I recently had the chance to stay in the Wimbledon Room, which is elegantly appointed in the classic Wimbledon colors of purple and green. The spacious room features vaulted ceilings, French doors that open to a private deck with spectacular views, and a large tiled bath with a two-person Jason MicrsoSilk tub. In an understated tribute to the world’s oldest tennis tournament, the room is tastefully decorated with antique tennis rackets and framed vintage postcards and other memorabilia from Wimbledon tournaments of the past. The supremely comfortable California King bed is outfitted with luxuriously smooth linens, a purple satin bed covering, and coordinating satin pillow shams. A flat screen TV provides the opportunity for catching up on tennis coverage from around the world. The inn’s other guest rooms include the U.S. Open, French Open, Australian Open, Davis Cup, and Mickey’s Room. Each room offers stunning views and is elegantly appointed with subtle nods to the respective tournaments and the sport. In the morning, Chris prepares and serves an incredible multi-course breakfast along with fresh brewed, locally roasted coffee made by Gold Country Roasters. The morning of my stay, the other guests and I were treated to mixed berries served with lemon curd, a pillowy, fresh-out-of-the oven Dutch baby sprinkled with powdered sugar and served with fresh raspberries, and homemade scones. It was a deliciously sweet start to the day. After breakfast, I set off on a hike among the giant sequoias at nearby Calaveras Big Trees State Park. Later that afternoon, I wandered the tree-lined main street of historic, downtown Murphys, which Chris likened to a Gold Rush version of Carmel. The charming, historic buildings house countless wine tasting rooms, cafes, shops, and galleries. Not far from the inn, Ironstone Vineyards offers a star-studded summer concert series, which runs June through September each year. This year’s headliners include Matchbox Twenty, Steve Miller Band, and Willie Nelson. Another must-do activity is to take a wine tasting tour along the region’s scenic, backcountry roads. Courtwood Wine Tours offers an intimate, behind-the-scenes look at Calaveras County wineries. The tour includes door-to-door transportation, a personalized wine tour itinerary, tasting fees at each of the wineries, chilled water and soft drinks, a delicious picnic lunch, and flexible scheduling all in one price. First photo courtesy of Courtwood Inn; all others by Ranee Ruble-Dotts for CABBI.